Hi everyone! First, I want to say thank you to all of you who left comments last week in my marathon of posts! I am getting around to visit, although very slowly. 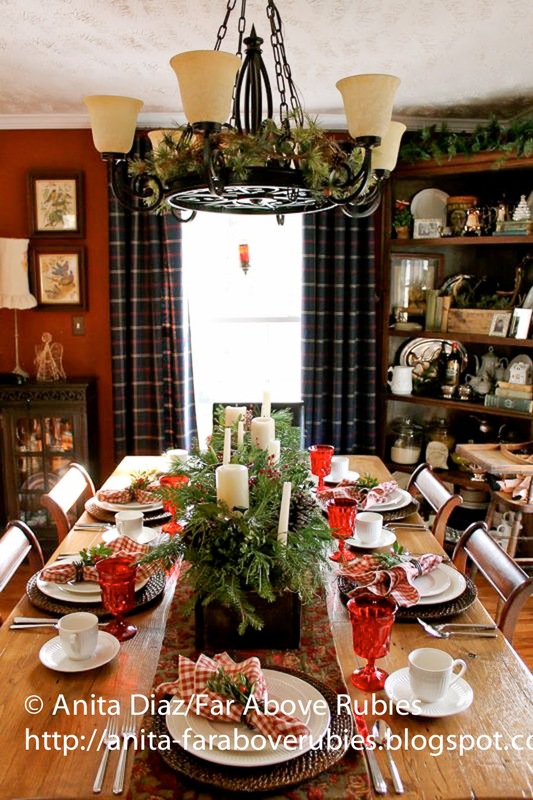 Today, I wanted to share a Christmas table with Mikasa "Italian Countryside" using a lot of the same elements from last week's table. Mikasa "Italian Countryside" flatware and dinnerware combined with vintage Noritake "Perspective" glassware my mom gave me, and the Walmart woven chargers I stained with dark walnut stain. My mom loves vintage glassware, and is an expert in collecting it. She has gifted me with several different patterns, but this Noritake "Perspective" is one of my favorite. These are napkins I made, and I just tucked boxwood, cedar and holly into the napkin ring. I kept the runner I made, the box filled with greenery, and the woven chargers from last week and changed everything else. I am always trying to make the most of what I have and stretch things as far as I can! Thanks for stopping by this week!! I'm hoping to have some outdoor porch photos up tomorrow with some incredible wreaths my mom gave me so be sure to stop back by. I was hoping for snow in the photos, but this year has not been white! 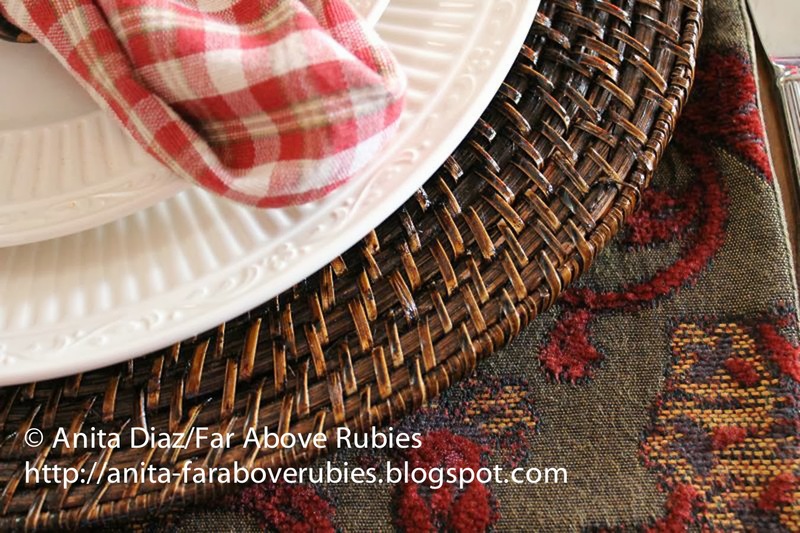 I'll be joining Susan's Tablescape Thursday. Gorgeous!!! I love the long box centerpiece down the middle and the glassware is fabulous. What a great vivid red color; you don't often see glassware with such a lovely red color! I was shopping this last weekend and spotted some Mikasa "Italian Countryside" dishes and I thought of you at once. They are such beautiful dishes, even more lovely in person, I think! Anita, your tables are each so wholesome yet elegant... Making them so very unique and gorgeous! Thanks for always sharing your amazing talents... Sending Christmas blessings to you and your family. Anita, as always, this table is fantastic!! 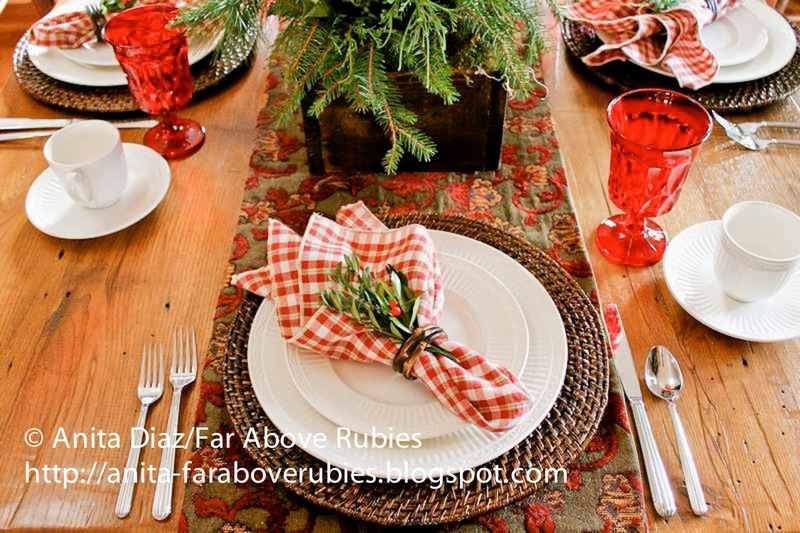 I love the Italian Countryside dinnerware and it works so well with your holiday setting! The box looks so festive with the all of the greens and candles. 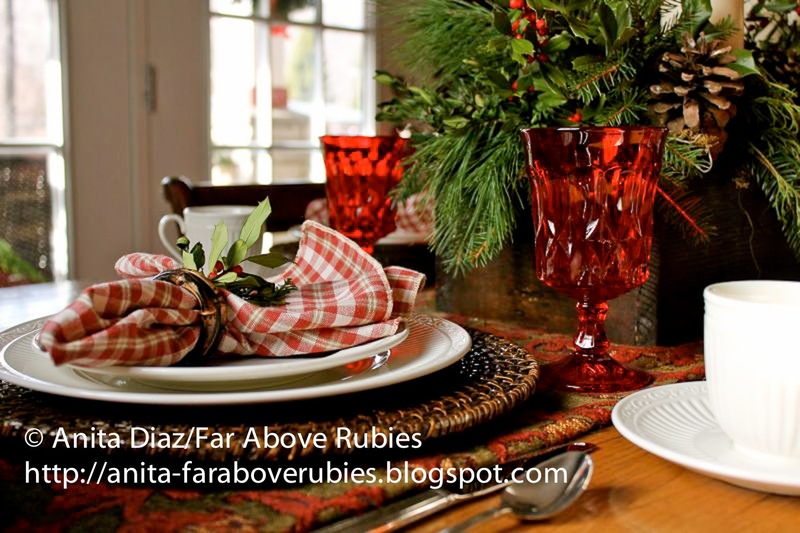 And your red glassware just sets the tone! Very pretty! LOve all the natural elements....your centerpiece is to die for! Gorgeous table! 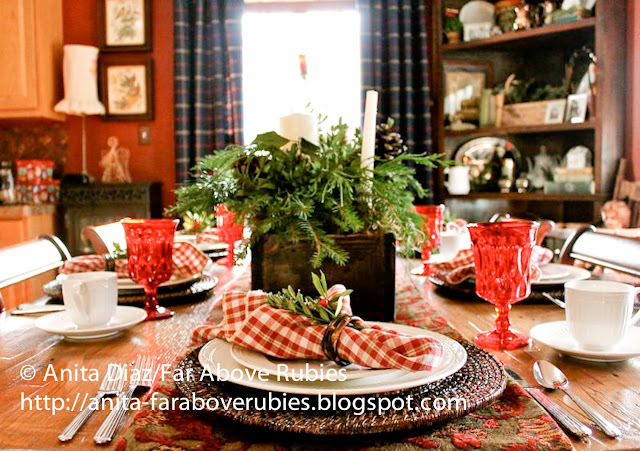 The red in your dining area is beautiful The other rich colors only help to enhance the Italian Countryside. And your silverware match! I'd love to come sit down at your dinner table for Christmas! We used to have IC but it was not kid friendly. And expensive to replace. Last year we ended up buying new dishes from Homegoods instead. Made me kind of sad. Thank you:-) I'm wondering why you say it's not kid friendly? I have three kids and we have used it since they were little, and it has been very durable because it is not stoneware, which does not hold up well at all. This one is so simple and lovely. I finally decided to gut up and start to collect Italian Countryside. I have four place settings so far. I love the way you use it so flexibly. And I'm glad you saved the centerpiece to continue to use it. I pinned that to copy cat it. I love it. Your tablescape is beautiful. It is so crisp. I love that you used things you probably had to create it. Also, I like the table. Anita, I LOVE your tablescape! Everything looks perfect. Those vintage red goblets are stunning...what a lucky girl you are!! Your guests will love sitting at your table. There are a few ladies that can set simple, but very elegant table...you are one of them, Anita. Your table is beautiful. I just realized that the orange/tangerine glassware I used for a fall table is Noritake Perspective...if not for you, I wouldn't have had a clue. Thanks! Anita, I absolutely LOVE your table! It's so simple, yet so beautiful and I still adore the wooden box. I hope to have my sweet husband make me one, too! I love using natural elements from our property in my decorations, as well, and yours are gorgeous! you have such a gift. 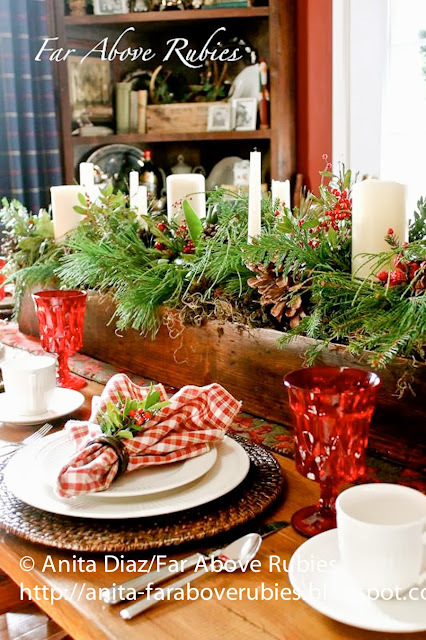 How pretty this is -- your centerpiece box has been a tablescaping treasure for all seasons. I'm crazy about your napkins...love the fabric and the fresh greens! Your table is quite lovely. I love your white pattern and your glassware adds so much. Your centerpiece continues to be your trademark as you change with the occasion. You are a natural tablescaper. So very pretty...I love your rustic elegance that you add to your tables each week. Your stemware is beautiful! Your mom does have quite a talent. I think I'm going to hit some antique stores over Christmas in search for red goblets!! Merry Christmas! Hi, Anita! This is the kind of table that would make me want to just sink in a chair and linger for hours and hours. It's simply beautiful! Have a good weekend, and have fun out there singing your hearts out on Monday! I just love your centerpiece. It is so beautiful. Are the candles in regular candle holders or the wrought iron ones with the spokes to hold them securely?